Status: offline How to allow Rynga VIOP ? I changed the connecton and since that time it is not connecting behind ISA. Ports need to be opened on the external firewall for connection to Rynga ? I think it is correct to open the above ports.? Anybody ........please focus & guide...? How to allow Rynga VIOP ? Status: offline Rynga voip (not viop) seems Skype like software. So start firewall logging one of client ip. Start Rynga from that client and tell, what firewall logs tell you. 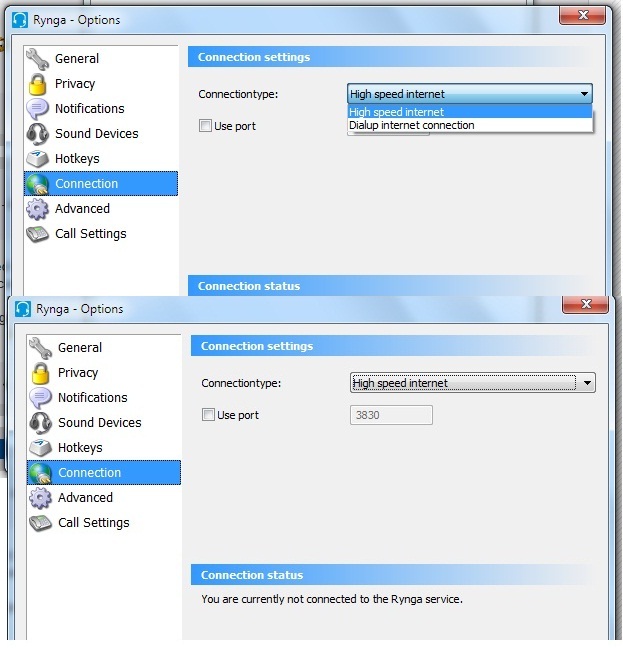 Rynga voip (not viop) seems Skype like software. no logs coming . . . Status: offline How is Rynga configured to connect to your ISA server? Does it support web-proxy or does it depend on local routing? (aka secureNat client) If so, can it route to (find) the ISA server? I have same problem for Action VOIP also. How is Rynga configured to connect to your ISA server? Does it support web-proxy or does it depend on local routing? (aka secureNat client) If so, can it route to (find) the ISA server? Status: offline I've checked the vendor's homepage and it seems like the product doesn't support Proxy. As does your screenshot proof. It depends on local routing. Does the computer where the client is installed on route to your ISA via the default gateway? You can check ISA monitoring/sessions and look for "secureNat" and the IP address of your client pc. If it doesn't show up, your client can't 'find' ISA.. I've checked the vendor's homepage and it seems like the product doesn't support Proxy. As does your screenshot proof. It depends on local routing. As I know there is no access list ..and it happened since i changed satellite connection to ADsl. I checked after enabling default policy for all. Status: offline Your clients need to route the traffic from their default gateway to you ISA server. Is that in check? Why don't you monitor on ISA for client traffic. And see what happens. If there's no traffic from your client (IP) while testing the VIOP program, then routing prolly isn't correct. *your client cannot FIND the ISA server. Else if there's traffic comming in, analyze the monitor.You will find the answer there. ISA Server with web proxy [ ip of itself ] - works with allow all with proxy. If I disable allow all policy.. it failed to connect. clients not able to connect anyway even they use ISA IP as a proxy or auto detect connection. Status: 0 The operation completed successfully.